Peter had a check up at the orthopedist's office today. We saw his new doctor, Dr. Belthur. The doctor said his feet look great! We also got a prescription for new Mitchell shoes, because he has just about outgrown his old ones. His bar needs to be lengthened, too. 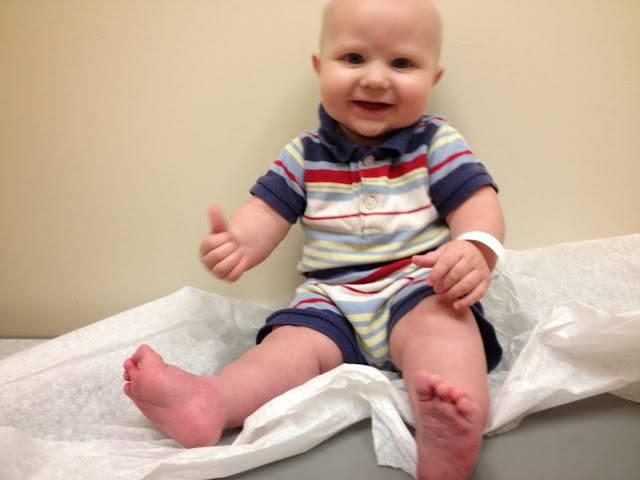 In non-clubfoot news, he is sitting up by himself and he has two teeth (both on bottom). Not quite crawling yet, but he is rolling around all over the place. He is a growing boy! So proud of my little man.